Jatiya Party Cochairman GM Quader on Wednesday said their party wants to play the role of a true opposition in 11th parliament that will go into session on January 30. “People don’t like when we remain both in the government and the opposition. We’ll play the true role of the opposition,” he said. 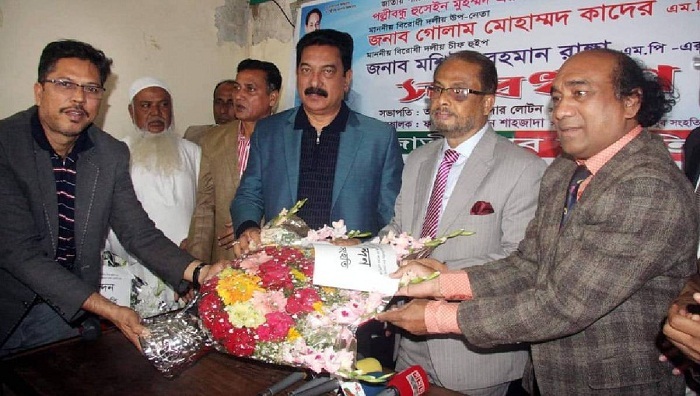 GM Quader, who was also appointed as the deputy opposition leader in parliament, came up with the comment while speaking at a reception programme accorded by Jatiya Jubo Sanghati at Jatiya Party’s Kakrail central office. He said their party will raise their voice in parliament to ensure people’s welfare instead of indulging in violent and anarchic acts. The Jatiya Party leader said they will praise the good works of the government and will also cricise its wrongdoings. GM Quader said they will also take steps for strengthening their party and enhancing its organisational capacity. Party secretary general Moshiur Rahman Ranga and presidium member Professor Masuda M Rashid Chowdhury, among others, spoke at the programme.